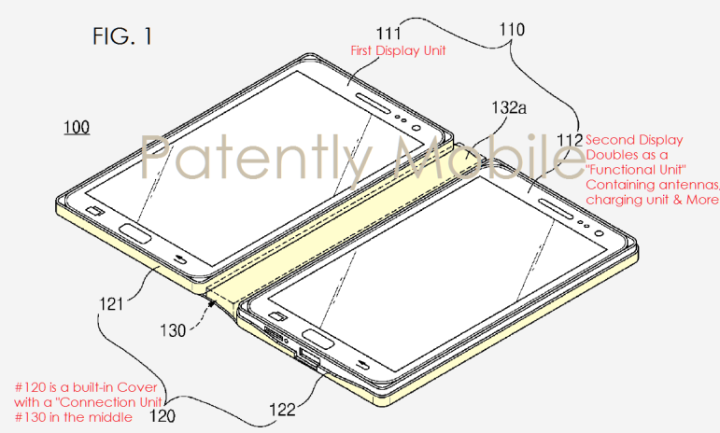 Samsung patents hingeless dual-display smartphone. A patent application Samsung filed back with the US Patent & Trademark Office in 2012 showcased a dual-display smartphone with an almost negligible seam between the two displays and the latest application shows that the company has improved the initial idea. The new patent builds upon that idea. It’s not positioned as a device that has a single seamless display when opened and would be great for watching movies, TV shows, etc. It’s positioned as a professional notebook meant for students and business customers which they can use along with an S Pen. Other features will include ultrasonic input over and above multi-touch, a project, sensors of UV, grip, biometrics, and more. It may even have a TV module. The patent also notes that this device may also include at least one medical device which could either be a heart rate, blood pressure, body temperature or blood glucose monitor.